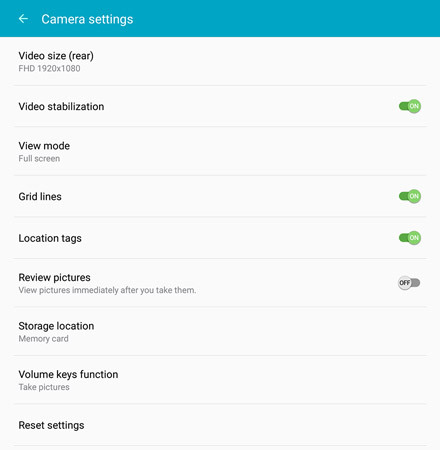 If you’re into making minor adjustments for your pictures, check out the Camera Settings on your Galaxy Tab S2 NOOK. The options vary depending on which camera you’re using, and sometimes on the mode you’re in. Tap the Settings (gear) icon and choose Camera to apply the settings you want. Tap Settings from the Camera screen to customize more details of the camera. Grid Lines. This tells the camera to display a set of grid lines on the screen as you prepare to take a picture. This is helpful in making sure the horizon is level or that buildings are upright and not tilting (with the possible exception of the Leaning Tower of Pisa). The grid lines are visible only when you’re taking the picture; they aren’t recorded in the file. Here you can turn on grid lines, add location information to image files, set the storage location for photos and other housekeeping details. Grid lines are essential when holding a thin, flat, rectangular tablet camera at arm’s length. It’s considerably more difficult to hold a tablet camera steady than a standard camera held at your eye level and braced against your face. Location Tags. Your Galaxy Tab S2 NOOK has a built-in GPS receiver, which can tell the device where in the world you are. This function records that information (as latitude and longitude) in the data for the file; you can later use an app on your tablet or a program on a desktop or laptop computer to look up the location of those geographic coordinates and tell you where the picture was taken: Pisa, Italy at 43°43’N, 10°24’E. What a world! 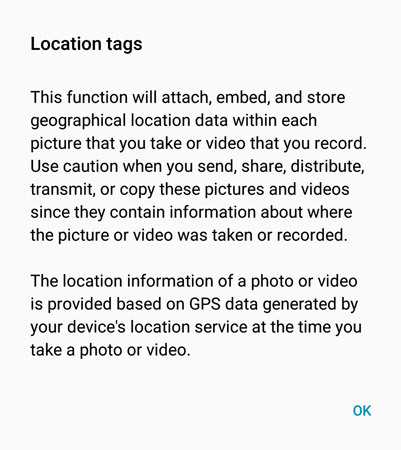 You can use your tablet’s GPS system to add location information to your photos, and then you can worry about someone spying on you because you did. The strength and accuracy of GPS signals can vary from place to place. Sometimes they’re weak inside buildings or in areas between buildings where the view of the horizon is blocked. Weather conditions can also affect GPS signals. If you leave Location Tag turned on, the tablet applies the last good signal it had to your photos, updating your position any time it can. In a perfect world, most people would say, “Yes, of course. What a nifty special feature.” But some people worry about privacy. What if that picture ended up in the hands of someone else — someone you don’t want to know where you were when you took the picture? If you send your pictures to someone else by email, or especially if you upload them to the Internet, you lose control over whatever information is embedded in the file. Review Pictures. You can turn on or off the brief display of pictures after you’ve taken them. Storage Location. If you install a microSD card in your Samsung Galaxy Tab S2 NOOK, here’s where you can tell the tablet where you want your photos and videos stored. In general, you should store your photos, videos, music, text files, and the like on the memory card and leave the built-in memory for apps. Zoom Key. Pressing the + or – side of the Volume key zooms you in or out; your Volume key is set up this way already. CamKey. You can make the Volume key into a shutter release key for photos. Rec Key. If you make the Volume key work as a Record key, pressing it in the Camera app starts or stops recording a video. Reset Camera Settings. If you’ve adjusted your camera, you can quickly return all settings to the original — like when first you unboxed your Samsung Galaxy Tab S2 NOOK. This is an all-or-nothing reset, and it only affects camera settings. Video Stabilization. This little bit of technical magic slightly reduces the effects of shakes or bounces while the video camera is recording. Beauty. When the camera detects a face, it sets exposure so that skin tones are well lit and skin is smoothed, a makeover without makeup or surgery. It works better in close-up portraits than in distant images, and some results are better than others. Gesture Control. More magic: Hold the palm of your hand out, facing the camera, and look for a yellow box on the screen surrounding your hand. Now take your hand away and the camera will take a picture a few seconds later.